Back in February, I photographed a fantastic kitchen design and remodel by Alinda Morris of Alinda Morris Interior Design. Alinda is so talented...and fun to work with! Happy to see this kitchen featured today on houzz as Kitchen of the Week. Congratulations, Alinda! Recently I spent a day with Lise Tanner of Lise Tanner Design photographing her complete re-design of a home in Olympia, Washington. Color is a key element in Lise's design work, so getting accurate colors in the photos was an important part of this project. The mudroom was particularly fun to photograph. And from a color standpoint, I think it's a good example of how things can go wrong. As well as how they can be fixed. This room was very long and narrow, with windows on either end. The windows were letting in a lot of nice, natural light. But along with all of that great ambient light came some pesky color casts. When I first looked at my out-of-camera shot, I really wasn't sure what color the cabinetry was supposed to be. The cabinets on the left looked extremely blue (most likely from the cool blue daylight coming in from outside). The ones above and below the bench looked blue-purple (from the red tones in the floor being reflected back onto the paint in that area). And the cabinetry on the right looked very blue-green (there were trees and shrubs outside the windows on the right, so a lot of green was reflecting back onto the cabinets at the far end of the space). I knew this wasn't how the cabinetry appeared in reality, but couldn't remember what the exact color looked like, so I contacted Lise to get the paint name and manufacturer. I then looked it up online to use as a reference. Once I knew what the color of the cabinetry was supposed to be, I went into Photoshop and found a color that closely approximated it. Then I selected all the cabinetry and brushed the correct color over the cabinets. I didn't do a 100% color replacement, though, because I find that doing so can look artificial somehow. Rather, I got rid of the majority of the offending color casts, but left just a touch...I think it looks more natural that way. By the way, there were indeed a couple of dogs wandering around, but they were a little too energetic to pose for this shot. Too bad...they were very handsome! This is the living room of a Tudor revival home I photographed recently. The space around the fireplace was a little crowded, but I was working alone and the furniture was heavy (and the lovely floors did not need new scratches! ), so rearranging things wasn't an option. Still, I thought the fireplace was deserving of some extra attention, so I zoomed in tighter for this vignette shot. I just love the detail in that stonework. Or are those tiles or bricks? I'm really not sure...does anyone reading this happen to know? 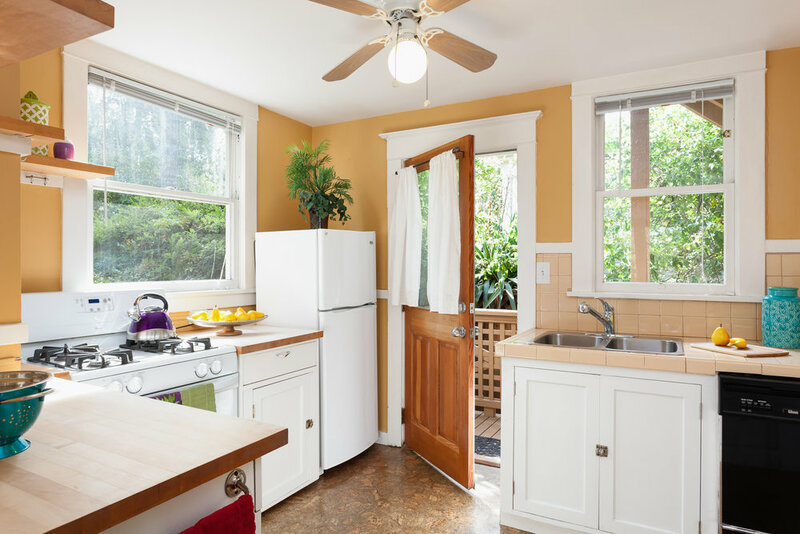 These are some shots of a house I photographed last week in Seattle's Queen Anne neighborhood. It was a 4-plex built in 1908 that had been restored and updated. A great old building! The client wanted to capture the details that gave it its early-20th-century character: the fir floors, the original windows and millwork, the exterior architectural details. And the warmth and comfort of the spaces. ...while the kitchen was quaint and homey. Aside from the original wood floor and the door (love that old door hardware! ), the bathroom had been nicely updated. Some exterior details. How about those elaborately-framed round windows and the curved rafter tails? Recently I spent some time working with interior designer Jodi Janzen, photographing her newly-completed bedroom design in a Seattle home overlooking Lake Washington. I took an immediate liking to this room. The color palette was cool and subdued. A wall of windows let in plenty of light, which glinted off the glass and metallic design accents, creating an almost jewel-like quality. Rich textiles and hardwood floors brought warmth to the space. It all added up to a room that felt elegant, comfortable...luxurious. These photos were taken for a client who wanted to document the renovation of his condominium unit. Built in 1930 in the Mission Revival architectural style, the place was packed with period details. It was important to the client that as many of these details as possible be shown in each photo. So often, photographing interiors is a game of problem-solving. And the primary problem, most often, is light. In the photo below – which shows the scene before any photographic lighting was added – there are some obvious issues: Many areas are dark and shadowy; there are strong color casts on the walls; and the architectural details are not as well-defined and vivid as they could be. To deal with these things, I had to supplement the existing light with some photographic lighting. The hallway in particular needed quite a bit of light; it was kind of a dark hole back there! And the bathroom required a fair amount of added light as well. I actually went a little ‘extra bright’ with the bathroom, to help guide the viewer’s eye from the living room in the foreground, down the hallway, and on through to the bathroom in the background (our eyes tend to be drawn toward the brightest thing in a photo). The living room was already getting a lot of light from the windows behind the camera, so didn't require as much additional light as the hallway and bathroom. By using supplementary photographic lighting in these three areas, I can show viewers what it might be like if they were actually standing in the living room, looking down the hallway towards the bathroom. In addition to lifting the overall light level, another reason for adding light when making this photograph was to alleviate the color casts, and to achieve more accurate colors in general. In the 'before' photo, you can see a strong greenish tint on the wall above the TV. This is caused by the sun reflecting light off the greenery in the trees outside the large windows behind the camera. There’s also a red cast on the ceiling and upper part of the wall near the door on the left. This is due to light hitting the floor and the door, where it picks up the red tones from the wood and bounces back up towards the ceiling. There's also a blue cast on the lower part of the wall to the left of the fireplace, and to a lesser degree, on the lower part of the wall to the left and right of the tiled stairs - daylight from windows will often produce blue color casts on objects in a room. These color casts (created by shifts in the color temperature of the light) exist when you’re standing in the room. But our mind does a great job of instructing our eyes to ‘normalize’ color casts, so that what we know is an off-white wall actually appears to be off-white when we look at it. By bringing my own photographic lights and adding light to the scene, I can more precisely control the colors of the light that the camera records, as shown in the second photo. Because the light I'm adding is of a consistent color temperature, it helps to neutralize the variations in color temperature (and thus the color casts) that are visible in the 'before' photo. The end result – though artificially created – is in a sense more natural, because it depicts the scene in a way that more closely mimics the way the mind’s eye ‘processes’ the scene when you’re actually standing in the room. My favorite spot in Seattle’s International District is Hing Hay Park. It's a great place to hang out...in the shade of the trees, at the red metal tables, or under the pavilion. A good spot to have lunch outside, run into a friend from the neighborhood, maybe play a game of chess or ping pong. It also regularly hosts civic and cultural events. True to its name (which translates as 'park for pleasurable gatherings'), it's a vibrant public space that serves as the hub of the neighborhood. Despite its location in downtown Seattle, it can be surprisingly peaceful and relaxing at Hing Hay. In the early mornings, before the delivery trucks arrive and all the other city noises fully kick in, you can sit in the park, listen to the birds, and forget that you’re in one of the densest parts of the city. Or even in a city at all. I like how this park can feel like either a hive of activity or a calming respite, depending on the time of day. Hing Hay Park was built in 1974, designed by the landscape architect S.K. Sakuma. Steps lead down into a central red brick square. Benches line the square, and tables and chairs are set up when the weather is good. The centerpiece of the park is an ornately carved and painted pavilion, designed and built in Taipei, Taiwan. There's currently some construction going on at Hing Hay. This is for the new expansion to the park. A large section is being added which will roughly double the park's size, while the existing portion of the park is undergoing some renovations. The principal landscape architect and civil engineer behind the expansion is the Seattle firm SvR Design. They've partnered on the project with the Beijing-based landscape architecture firm Turenscape. The design for the expansion includes a plaza, a perforated-metal gateway that will function as a performance space, terraced bleacher-style seating, activity spaces, curved walkways, and abundant landscaping. The expansion will flow into the existing park, creating one unified public space. At the moment, the site of the expansion may not look like much more than a random, and rather chaotic, pile of materials and machinery. But that’s one of the things I love about construction sites: Watching something rise out of, seemingly, nothing. It's fun to see someone's idea come to fruition as, over time, something identifiable starts to take shape from what was once just a pile of dirt and rubble. So I’m pretty excited about seeing the new park when it’s completed in a few months. It should be a great addition to the neighborhood. More renderings (unobstructed by chainlink!) of the final design can be seen here. This is a detail shot of the guest bathroom in a custom designed-and-built home. The bathroom had no window, so the space received almost no natural light. With this in mind, the homeowners chose colors and materials that were light, bright, and glossy, to maximize light reflection. The faucet is the BauLoop by Grohe. With its chrome finish and clean lines, it is cool, functional, and minimalist. The lime green tiles are 1"x6" glass subway tiles by Susan Jablon. The countertop is polished white Caesarstone, and the wall color is Nimbus by Benjamin Moore. Love how all of these elements come together to form a simple, modern, and elegant bathroom design. Well done, homeowners! Fire Station #10 sits at the edge of downtown Seattle. It’s in my neighborhood, so I walk past it regularly and have photographed it a number of times. I’m a fan of the architecture (the building was designed by Weinstein A+U). I like its clean, modern aesthetic, and how it feels solid without being imposing. The bits of red contrast nicely with the mostly black and grey tones of the façade. And the way the wall of glass doors opens out towards the street feels inviting. The fire station connects well with the neighborhood, and provides a nice transition between Pioneer Square to the west and the International District to the east. Photographed during the day, the building makes for a crisp and clean subject. But capturing it at twilight brings out something very different. There’s a certain drama that twilight photography lends to a subject. As the daylight fades and the artificial lighting becomes more pronounced, a beautiful effect occurs: The warm, golden glow of the lights begins to contrast dramatically with the darker, distinctly blue tones of the surroundings. It's a compelling look. Sometimes even a little mysterious. Fire Station #10 is a perfect subject for twilight photography, with its wall of glass that encases the fire truck bays. At twilight, the bays become illuminated by the interior lights, making it possible to see inside the structure and catch a glimpse of the iconic red fire trucks. It took some waiting to get this shot. Twilight shots always do. You arrive early, find your composition, set up the camera on the tripod. And wait. Mostly, you're waiting for the moment when the light is just right. In this case, I was waiting for the perfect light and for the fire trucks. Because just as I was arriving to take this photo, the doors opened and all of the trucks headed out on a call. And what would a photo of a fire station be without fire trucks? I figured there was a slight chance that they might return before it got too dark to take the photo, so I decided to wait a little while. Then, just as that 'perfect light' moment was about to pass, the trucks returned. Once all of the doors were closed, I quickly took the shot. The twilight version isn't necessarily better than the daylight version, but it is different. It conveys things about the structure and its environment that the daylight photo can’t. So whenever I have the chance, I like to shoot a building under both sets of lighting conditions, daylight and twilight. A few months ago, while visiting Tucson, Arizona, I had the chance to photograph my brother Tom’s home. It’s a sweet little bungalow, built in 1915, in an architectural style reminiscent of the Craftsman bungalows that are so common in Seattle. Tom bought the house in 1994, for $32,000. At that time, it had been a rental property for decades, and was largely in a state of disrepair. Over the course of the next 20 years, Tom gradually renovated his house. With spectacular results! It feels new in all the ways you’d want a house to feel new, yet at the same time, the original character of this century-old house is fully present. It is both modernized and historically intact. Not a bad combination. I recently asked Tom to tell me about the house and the renovation.